Although bees are incredibly important to our ecosystem, they’re not an insect you want buzzing around your home or your person. However, killing bees and taking out swarms has severe implications for humans. We rely on bees to pollinate and help grow many of the crops humans need to survive, so while we might want to keep them away, killing them is not an ideal solution. Not only do bees carry a painful sting, but many people are allergic to them, to the point where they may require immediate medical attention. That’s why finding an effective natural bee repellent can be so important, especially as summer rolls around. 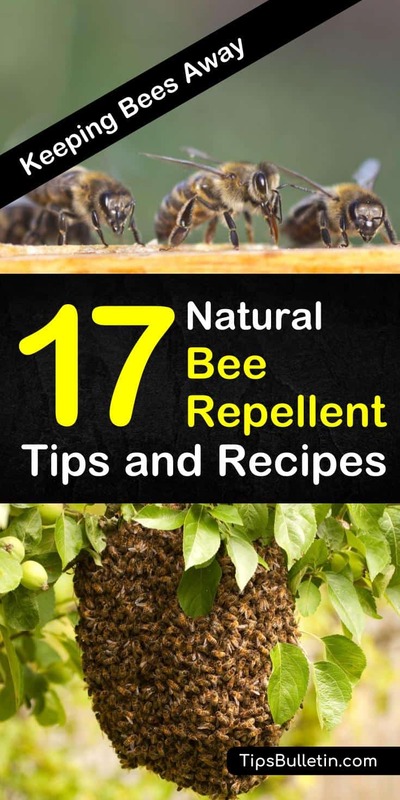 Whether you’ve noticed these unwanted pests around your house and want to keep the far away, or you want to be able to enjoy a picnic or other outdoor activity without having to worry that swarms of bees will crash the party, these 17 homemade bee repellent tips and recipes can help. This effective pest control spray works on just about anything that buzzes, including wasps, yellow jackets, honeybees, and any other pesky bees. It will also deter bees from hovering around you or any other area you spray it, without killing them. Add the witch hazel to a spray bottle and then add the essential oils. You can use just one if that’s all you have on hand, or you can combine both. Return the top to the spray bottle and shake to mix all of the ingredients. This spray work not only to get rid of bees but is also useful as a general insect repellent and is great to get rid of wasps, so it works for any outdoor activity. This natural repellent might sound too easy to be true, but cucumber peels are an excellent method of getting rid of your bee problem. Cut up a fresh cucumber and line them in a single layer along an aluminum pie dish. The reaction that occurs when the cucumber and aluminum come into contact emits a chemical scent that bees can’t stand. This is also one of our favorite home remedies for wasps, so set the pie dishes around any wasp nests in your yard. A more natural solution for smaller spaces is cucumber peels. If you open your windows to let in a fresh summer breeze, place some fresh slices of cucumber skin along your windowsill to keep bees away. Bees are always out looking for flowers to pollinate, and if you wear bright colors, then they might mistake you for their goal. Colors like red, yellow, purple, and green are bad news if you’re trying to keep bees away. This not only applies to the clothes you wear but the accessories or décor you use in your backyard or during a picnic. You should also avoid floral patterns. Choose muted tones for clothing and tablecloths instead if you want a bee-free zone. Bees don’t like the smell of peppermint, making it one of the best natural ways to repel the pesky insects. Place peppermint plants inside or around the exterior of your home, or any other area you want bees to avoid. If you’re not a plant whisperer, you could also opt for dabbing peppermint essential oil in strategic areas, or dip cotton balls in the oil and set them around your home. Distilled vinegar is an excellent alternative to commercial repellents when it comes to keeping bees out of the house or garden without using harsh chemicals. Just pour vinegar into small, open containers and leave them in areas where you don’t want bees hovering. The buzzing insects won’t approve of the strong smells coming from the bowls. Clean items like birdhouses or hummingbirds feeders with vinegar once they’re empty. With a thorough cleaning with vinegar, you won’t have to worry about any beehives appearing inside. Bees don’t just fly around aimlessly. They have a goal: to get to pollen and nectar. If you’re having a barbeque, then you’ll want to move certain plants or flowers away from patio furniture, lawn chairs, or anywhere else your guests will be. While bees don’t love all flowers and plants, there are plenty with sweet smells that bees can’t resist. Knowing which plants bees like also helps when planning your garden. Keep the bee-friendly flowers to the edge of your property, away from your house, especially if you want to keep bumblebees away. Cinnamon is another effective natural way to get rid of bees. It is also particularly helpful for driving off ground bees. These types of bees nest underground and include bumbles and carpenter bees. If you notice mounds in your garden or lawn or mud clusters, then sprinkle some cinnamon in the area. You can also place cinnamon sticks near these nesting areas, or leave some around open windows to prevent bees from flying inside your house. As we previously mentioned, bees are hunting for pollen from flowers. However, there are some plants that they avoid. Marigolds give off a strong smell that repels bees. As this flower blooms throughout the summer, they’re perfect to plant around swimming pools or other areas where you entertain. Either plant them in a flower bed or keep potted marigolds that you can quickly move around your property. Garlic has long been an answer on how to get rid of bees and other insects or pests. You can sprinkle garlic powder near windows, or crush cloves and leave them in your garden. Another way to use garlic to repel bees is to chop some up and let them soak in a glass of water for a few days. Take that glass of water and set it near you to keep bees from getting in your space. While you don’t have to worry about bee stings from carpenter bees, they’re still not great to have around your property. A large carpenter bee population can do a lot of damage to any wooden structures they nest in, so this natural carpenter bee repellent can help you protect your property. Cut up the citrus rinds, place them in a pot filled with water and set them on the stove to boil. Let the mixture cool and strain into a spray bottle. Spray on the surface where the bees have burrowed. Carpenters bees hate citrus oil. That’s why fruits have a rind, to protect the fruit inside from natural predators, so this natural spray will naturally repel them. This bee bait will attract insects but isn’t meant to kill them. This technique works because it will lure them in and keep them away from you. The goal is to make something that smells sweet enough to draw the bees to it. In a bowl, pour a large amount of soda, maple syrup, orange juice, or any other fruit juice. Set the bait at least five yards away from where you will be. A sugar-water mixture will also work. This solution is perfect for picnics or outdoor barbeques, or any other occasion. Set the bait out approximately 20 minutes before you and your guests are planning on going outside. Vanilla extract is a perfect natural bee repellent to apply directly to your skin. However, if you’ll be putting it on your body, dilute it with water to avoid any skin irritation. You can also soak cotton balls in vanilla and leave them strategically around the house to keep bees outside where they belong. There are many essential oils that bees and other insects avoid. You can either mix an essential oil with water at a ratio of about five drops to a ½ cup of water and use that mixture as a spray. You can also dab it on your skin, or soak a cotton ball in the oil. Mix various oils together or use them on their own. Organic baby powder will also keep bees away. Sprinkle around the entrances to your home, like windows and doorways, or put a fine layer of dust in any other area that you want to keep bee-free. As not all baby powders are natural, make sure you find an organic brand. Bees will also steer clear of mothballs. Place some in cheesecloth or old nylons and hang them near any bee’s nests you’ve found around your yard. The overpowering scent of mothballs will cover other sweet-smelling odors, and the bees will avoid the area. Using cayenne pepper is a powerful solution to protect you from bees. Cayenne smells very strong and irritates bees, so they will not approach an area that has the pepper sprinkled around. If you’re having a problem with ground bees, sprinkle some cayenne pepper in your garden to prevent them from burrowing in the soil. This natural homemade bee spray will protect you in the summer sun. It combines many of the powerful repellent ingredients we’ve already mentioned and is quick to make. Whether you decide to include all the ingredients is up to you, as a soapy mixture of half-water and half-soap is an effective repellent on its own. Mix the dish soap and the water in a spray bottle. If you plan to use this solution inside, you might want to use less soap. Include the peppermint oil in your mixture to help repel more bugs, including hornets. Add the 1/8 teaspoon of cinnamon and the 1/8 teaspoon of cayenne pepper to the soapy water mixture for the most potent effect. Spray popular bee areas as needed. We hope these DIY tips have helped you learn how to keep bees away the natural way. Remember, bees are essential to a healthy ecosystem, so it’s better to repel them than to kill them. 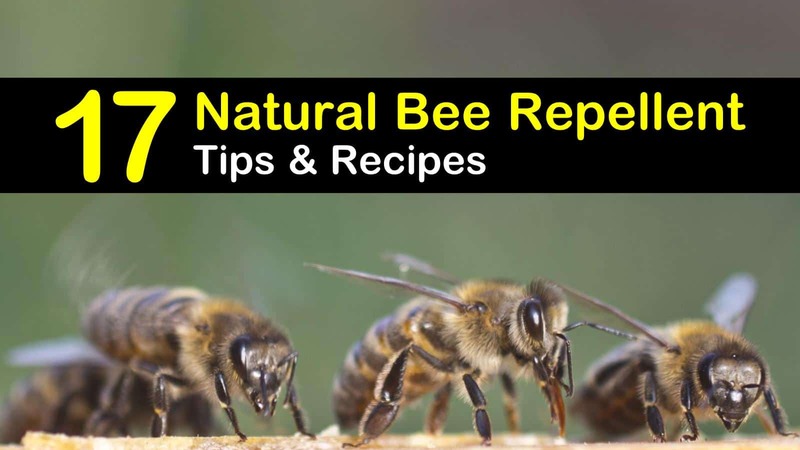 If you want to help your friends and family learn how to make a natural bee repellent, then please share these pest control tips online.